Home » george w. bush , government , history , president , united states » George W. Bush leaving with lowest approval of a President EVER! What is wrong with Bush in that picture?? He looks stoned. I just like saying it about Bush. I believe with my heart and mind that Bush was used by God to prove who in America are really following Christ and who are not. Think about all of the ‘Christians’ who think that Bush was anointed by God. But we are told that ‘by their fruits will you know them.’ Bush made no fruit for Christ. And many ‘Christians’ do not care that he didn’t. The Iraq war was the most far away from an act of a Christlike mind that any president ever conducted. Isnt it just sad that he couldn't stay in office to build the score up some more. I think that people strongly underestimate Bush. I think that he has done a good job of course not as good as others. Another thing is that we do not know all the facts behind some of the decisions that he has made. I don't think presidents make decisions for the fun of it and I am sure that he had good reason for many of the things that he has done. SO why dont yall just give the man a break and the new president that is supposed to sore like an eagle will hopefully improve our nation and things will get better but the sad thing is he will have to make the same hard decisions that Bush made and he will have fans and opponents. It is interesting that Obama is starting out with the Lincoln style trip to washington. He must really want to follow the foot steps of one of the greatest republican presidents ever. But remember I hope he does not follow to closely, you know Lincoln's outcome and I dont think that he wants the same end result. Now... I defy anyone to tell me that there is anything successful, conservative, or otherwise "positive" about the George W. Bush presidency. What will Ron Baity and the idiots of Berean Baptist Church say about this? -The Iraq war something that should have already been finished we just had to do a little more to get the job done. -National Debt (this Man Single Handedly destroyed the National Debt? -Ramos and Compean (he is not the judge or the prosecutor in the case) He is just one that can give a pardon and that is at his discretion. -American jobs are not an outcome of a single individual. He may have contributed but I hope that you can look upon the other legislatures and find some blame for them as well and the failed housing market. -illegal aliens Lets see what Obama will do with that one. Surely the mighty hand of one president can stop every single illegal alien before they step one inch onto American soil. -You got me with compromising port safety yes he blew that one. -all administrations are corrupt and it is so deeply rooted that you cant tell how bad it is. Chris just say you hate George W. Bush and go on with life. He is leaving office and There is a new president coming to town and he will more than likely fulfill your need for leadership and guidance. It will be interesting to see how things go forward. I'm gonna hold Obama to the same scrutiny that I held Bush to. But defending an elected official because he/she maintained the status quo, is, well... not good, to put it mildly. - Wiretapping is NOT supposed to take place without a darned good reason, and agreed upon by a judge. The "secret courts" that Bush established do not hold up under the Constitution. But then, this is a President who basically believed, like Ron Price, that because "he was elected", that was carte blanche to do ANYTHING that he wanted. So it was also with habeas corpus, which Bush also pretty much destroyed. - No Child Left Behind was the WORST thing to ever happen to public education. It makes the teachers "teach a test" instead of teaching the kids how to THINK with the minds that God gave 'em. Incidentally, No Child Left Behind was based on a failed program that Bush tried as Texas governor. I heard PLENTY of how bad he screwed up that state's schools when I was there. - George W. Bush will go down in history as the President who, more than any other, brought what can only be called "national socialism" to the United States. Didn't we fight one world war against that kind of thing? - The Iraq War should have never happened in the first place. This will go down as the BIGGEST blunder in the history of American foreign policy. And as I have said many times before, it is IMPOSSIBLE to "export democracy". Democracy is not a magic bullet loaded with virtue. A people have to WANT it first, understanding fully well the responsibilities that come with it. On that note, Iraq on our watch is nothing but a complete fiasco. - The United States is supposed to be "the good guys". If we're gonna even pretend to set a standard for the rest of the world then we have to set a higher moral standard for OURSELVES. Torturing others, even if they ARE out to destroy this country, is not how to do that. If anything, that just proves that we ARE as bad as "they" make us out to be. - The Department of Homeland Security is the biggest waste of money and resources, that has ever happened to our federal government. It does nothing but provide what I and a lot of people call "security theater". And the Transportation Security Administration is the worst of it. - Bush and his kind practically ENCOURAGED relocation of jobs to overseas. I was one of those that were screaming against NAFTA fifteen years ago. Bush's policies made NAFTA looks positively timid. - Blaming OBAMA for the influx of aliens?!? Bush had EIGHT YEARS and he did NOTHING about our porous border. Have you been paying attention to the news out of Mexico lately, friend? That country is on the verse of complete collapse. If it falls in, that's going to be MILLIONS more Mexican citizens that are going to come streaming into the United States, practically overnight. Now, HOW are we going to handle all of them? We can't. It might be Obama's problem by that point, but Bush was certainly the one who made it possible. - We currently have NO reserves ready for active military deployment. All of our defense resources have pretty much been wasted in Afghanistan and Iraq. When 60 year old army reservists are being called up for full-time duty halfway around the world, there is a problem. - Harriet Miers demonstrated the rampant cronyism of this administration. And that it was not a thing of virtue after all. - I disagree. Human nature on its own is a corrupt thing, but you CAN tell how bad it is. And it should not keep us from expecting BETTER. Speaking of which, if George W. Bush was the paragon of Christian virtue that his supporters claimed that he was, then wouldn't his administration have reflected that? That's what one commenter alluded to earlier on this post, and I have to agree with him/her. I will say this: if Obama were to pardon Ramos and Compean, as soon as he can, then I will certainly be inclined to look upon him a LOT more favorably than I ever could with Bush. I will never believe that Bush was a legitimate president. 2000 election was filled with so many problems, Bush should have tred carefully. 2004 was worse. There are many questions still about whether Bush won in precincts that had electronic voting. How do we know without paper audits? Kerry could have won if there was honest voting. But a cloud of doubt will always hang over Bush because of his elections. For the first time in his entire life, George W. Bush earned something on his own. That writer thinks that Bush is like Jesus Christ himself! If Bush is anything like Christ then he should be nailed bleeding and screaming to a cross. And hung upside down in respect to the god he really serves. Bush looks like a monkey in that photo. Maybe evolution is real but its going backwards. Harry Truman accomplished the Marshall Plan, the Berlin Airlift, establishing the state of Israel, forming NATO, and he ended World War II. George W. Bush accomplished....I'll have to get back to you. IRaq war??? Are you kidding me...how many quotes do you want me to provide showing Dems support of that war....most long before Bush was even president? Forgot about that didnt you...forgot about Congress and the Senates support. DHS....it means nothing to you that we havent had another attack since the Democrats alllowed Osama to go loose and help plan the mist horrific attack on US soil in history....your memory is lacking....youre living in 9/10. NO reserves? ?....your truly ignorant. Not only have we got reserves...the military AGAIN made its 2008 enlistment goals. Border guards? wrong on that too. Agriculture? Better tell my wife ag has been devestated and not to go shopping since -we make our living from agriculture and life is pretty dang good. Bringing in more food than exporting???? WHats stats are you looking at...the last number the USDA put out was Nov....exports 9.3 Bil versus imports of 6.4 bil. Maybe you should know a little about the topics your trying to discuss before blogging. I'm not sorry for saying this: I can't respect ANYONE who bases the crutch of their argument on something so shallow as "...but the Democrats did it too!!!" Thats what I figured,...disregard the facts for lack of knowledge. Thats really all you got? You cant come back with some figures and facts of your own...about agriculture, the courts decisions, stats...anything? Thought so. Can YOU impress me with WHY we should continue to be imprisoned by the false dichotomy of the "conservative"/"liberal" paradigm? Because this blog and its owner deal with ideas. Not with blind ideologies. And the only reason why enlistment goals were met is that there have been gradually LOWERED set goals ever since 2003. It's a trick with numbers and paper, that the goals were met at all. And as for Osama bin Laden going loose: wasn't it George W. Bush himself who said that getting Osama was not that big a deal? Truman had a plaque on his desk that said "The buck stops here." With George W. Bush and his few remaining supporters, it's more like "the buck never got here!" I have called myself a conservative since high school. The first president that I voted for was Reagan in 1984 and I am proud to say that. Words cannot express how disappointed I am with George W. Bush. Bush is not a real conservative. His family has never been conservative. And real conservatives have never supported Bush. We saw through him a long time ago. I don't believe Bush is a real Christian either. Karla Tucker paid what she owed but that wasn't good enough for Bush. He wanted to mock her death too. You are a real conservative Chris even if you don't admit it. You are more conservative than Bush is and that's the truth. But I like that you have sincere compassion for others also. So I guess you are a liberal in some ways. But that's okay too. Just keep being you! Bush and Cheney both got booed hard by the crowd! Has that ever happened at an inauguration before? Worst President and Vice President ever are now gone! 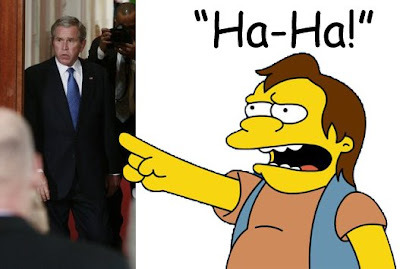 The Bush Error is over! Now let us pray for President Obama and the tasks before him. I am glad you menationed Truman....Chris, did you know that Truman had lower approval ratings than Bush......lol.....yet you and history hold him in high esteem. Again, dont bother addressing the facts that were laid out about agriculture, torture, wire tapping, etc....just go along with some red herrings in an effort to divert from the fact that you have no facts....just rhetoric. Stick with Battlestar Gallattica, I assume you actually know something about that. "One way or the other, we are determined to deny Iraq the capacity to develop weapons of mass destruction and the missiles to deliver them. That is our bottom line." Iraq is a long way from USA but, what happens there matters a great deal here. For the risks that the leaders of a rogue state will use nuclear, chemical or biological weapons against us or our allies is the greatest security threat we face." We know that he has stored secret supplies of biological and chemical weapons throughout his country." Bush-bots, I long ago had to sadly conclude, are mentally ill. Incapable of any grasp of reality other than what the neocons spin for ready digestion. I cannot respect, at all, anyone from any political stripe who rests their arguments on not much more than "...but the OTHER party did it!!!" Nice red herring AGAIN....dont address the issues....just divert ...quick, youre losing another debate. I already addressed the issues. And you sound WAY too much like Johnny Robertson. Right down to the bad spelling. You didnt address a single issue....maybe you should stick to stage left, stage right...and let those of us with an education worry about ag stats, military stats and any other socio-politcal-economic issues......oooo you mispell....ooooo I got you....simpleton. Yeah, you've GOT to be Johnny Robertson. No doubt about it. Except you're still lying, 'cuz you don't HAVE an education. You wasted those years in prison for armed robbery, didn't you? ...the fact that you have discovered how to use the Internet with your cell phone, isn't particularly impressive to me.